Robert Campbell Paterson was born on 20 September 1907 in Edinburgh, the son of Robert and Wilhemina Paterson. He was educated at George Heriot’s School in the city. On leaving school, he worked as a clerk and then as a driving instructor, being the first person in Scotland to have a franchise from the British School of Motoring. He was also the part-time chauffeur for the author Sir Compton MacKenzie. 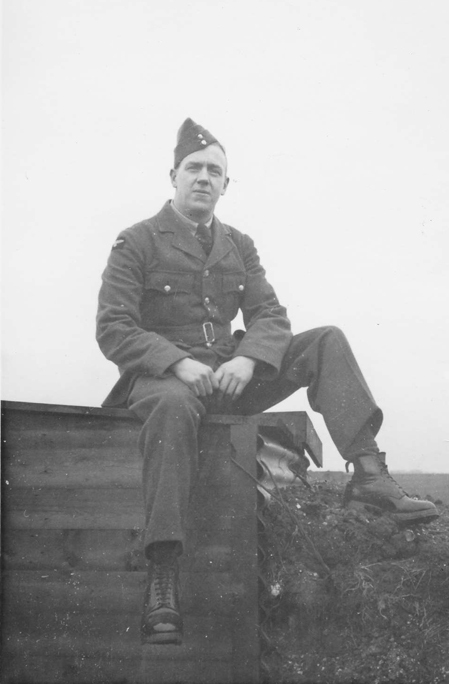 Paterson was keen on motoring and mechanics and as the war approached joined the RAF to serve as ground crew. In June 1942, he took the opportunity to fly on heavy bombers and qualified as a flight engineer. He was then posted to 1654 Conversion Unit where he crewed up with Cyril Anderson and the rest of his crew, who had been posted in from an Operational Training Unit. The crew were posted together to 49 Squadron in February 1943, and did their first operation together as a crew on 12 March. After their second trip, they were posted to 617 Squadron but in fact stayed on 49 Squadron to do three more operations, including two to Berlin. Paterson was the oldest in a crew which had a 29 year old skipper and was older than the average. This would have singled them out in both the mess and the crew room. After their trip on the Dams Raid, they returned to 49 Squadron and resumed their operational career with an attack on Krefeld on 21 June. They flew on 14 more operations after this, but on 23 September they failed to return from a successful attack on Mannheim. As they headed home, their aircraft was shot down by a night fighter near Offenbach. Robert Paterson died three days after his 36th birthday, leaving a wife and a four year old son. His school Roll of Honour indicates his modesty, saying that he “consistently refused to accept promotion and honours.” He was first buried with his crewmates in Offenbach Cemetery. After the war the bodies of all seven were exhumed and identified, and then reburied in Rheinberg War Cemetery. Thanks to Stuart Paterson and Dom Howard for help with this article.